When Empires break up, newly independent states often want to change languages. Not always: in Africa, former British and French colonies have generally kept the colonial languages as the medium of public administration simply because those are the only languages people have in common. Likewise, when the Parliament of newly independent India met in 1947 and had to choose the language of debate it settled for English - a bit reluctantly but, still, it was the only language every member of parliament understood. When Imperial Russia disintegrated, five new states hurried to eliminate Russian from public life. Finland already had tri-lingual postmarks and those remained in use - but with the Russian third filed down or otherwise removed. Finnish and Swedish were retained. Estonia, Latvia,Lithuania and Poland had only monolingual Russian cancellers available or German Occupation ones. Neither were acceptable and so we see a period in which rather crude handstamps or manuscript cancels are used. If you look at the Harry von Hofmann Lithuania collection, currently on line at www.heinrich-koehler.de you can see a very scarce and unusual range of Lithuanian manuscript cancels on offer. Despite the desire to replace Russian, the correct spelling of replacement names had not always been established before the change was made. Thus, early Latvian postmarks spell the country name LATWIJA only later replacing this Germanic spelling with the alternative LATVIJA which has persisted until now. Similarly, in Estonia the town which transliterates from Russian as VESENBERG but is usually known as WESENBERG initially became RAKWERE and only later RAKVERE. In the Caucasus, there was no great haste to eliminate Russian. Interestingly, the first stamps of Azerbaijan and Georgia (and a couple of new postmarks produced to go with them) are inscribed bi-lingually with French as the language chosen to make the stamps internationally recognisable. Armenia's Dashnak government chose English as the language for the Chassepot series of stamps commissioned in 1920. It may be that this choice reflected the heavy reliance which Armenia was placing on the good offices of the USA and Great Britain to protect it. In the Caucasus, the production of cancellers in local languages only really gets going in the early Soviet period (1921 - 29) and can be seen as an expression of early Soviet Nationalities policy. Azerbaijan is interesting because policy there took its lead from Turkey: when Ataturk switched his country to the Roman alphabet, Azerbaijan followed. Inevitably, "correct" Roman spellings were not always obvious. Emerging from the Austro - Hungarian empire, Western Ukraine produced some cancellers in Ukrainian. Later, when Western Ukraine became part of Poland, old Imperial-period bi-lingual cancellers continued in use, generally with the German names filed down or otherwise removed. Lastly, there is Ukraine. 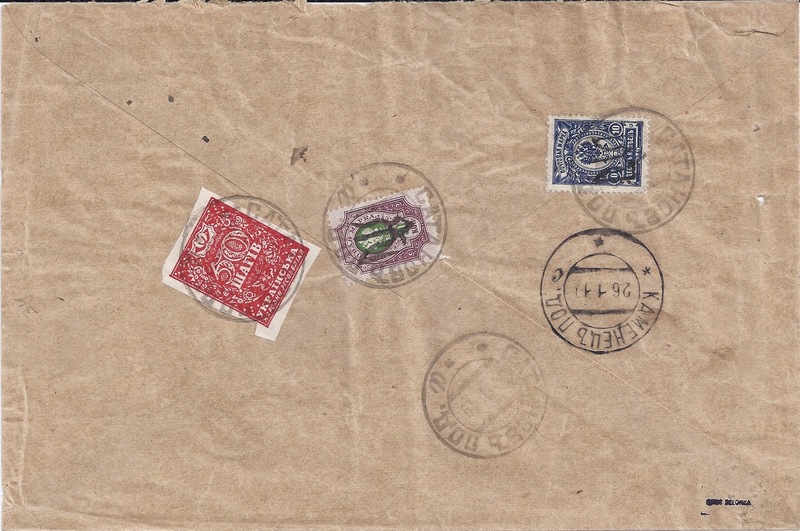 The newly independent republic operated an extensive postal service at least through 1918 and into 1919 but did not try to Ukrainize the Russian cancellations or replace them with manuscript, presumably because Ukrainian speakers could perfectly well understand the postmarks and weren't that offended by them. A couple of cancellers in Ukrainian were produced for Kiev (reading KYIV) and for Kharkov (reading KHARKHIV) and that's about it. Some postal stationeries were produced centrally and, in addition, one enterprising postmaster in Yampil ( Russian Yampol) did produce his own Money Transfer Forms printed in Ukrainian - but as John Bulat remarks in his Catalogue, his spelling wasn't perfect. I do something similar when I write, "sent from Moscow and cancelled MOSKVA" though why I don't write "sent from Moskva and cancelled MOSKVA" opens up a whole new set of interesting questions about how we treat other people's place names. The only short answer is this: We treat them inconsistently. * I chose Sataniv / Satanov because it is an interesting place to Google. But Googling again, I see that there is a further dimension to the language problem. Sataniv / Satanov was - in the period 1918 - 20 - as it had been for a long time - majority Jewish and majority Yiddish-speaking. One of my Google sources reckons that Yiddish speakers called the town by its Russian name, Satanov. In that case, it's likely that very few inhabitants - possibly none - called it Sataniv. It would have become Satantiv at a later date and primarily through the application of a centralised state policy. 1919. 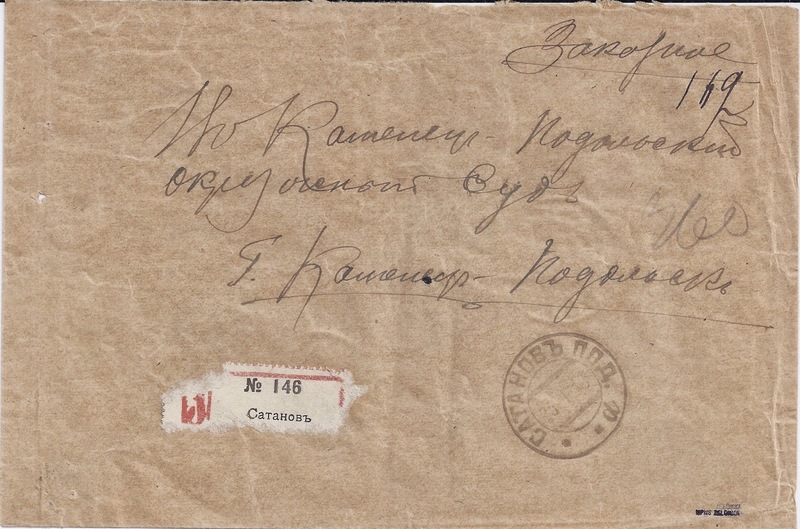 Registered letter addressed in Russian to the Kamenetz Podolsk District Court, franked to the equivalent of 85 kopecks, the stamps cancelled SATANOV POD "a" 23 1 19, receiver cancellation KAMENETZ POD. "s" 26 1 19, the cover expertised UPNS ZELONKA.